If the government shutdown isn’t enough to convince you just how interwoven health care and finances are, nothing will. You can keep your own budget from shutting down in the face of health concerns, however. During the season of sickness, when cold and flu germs lurk all over, it (literally) pays to build up your immune system. Find out now: How much mortgage can I afford? The answer is already built into your budget: groceries. By including nutrient-dense foods in your diet and incorporating certain plants and herbs, you can stop colds and flus from ever taking hold. This way, you can spend the money you save on medical care on things that really matter during this season- sporting events and weekend cabin trips. You already know the obvious ways to stay healthy- eat lots of fruits and veggies, get your beauty rest, and drink plenty water. By all means, please continue to do these things. To stay a step ahead of the game, increase your intake of fiber-rich and fermented foods. Fiber is one of the body’s MVPs. It helps regulate blood flow, inflammation, cholesterol, blood sugar levels, and normal digestive function, all of which affect the immune system’s strength. Apples, artichokes, broccoli, and potatoes are among the many veggies and fruits that are fiber dense, and are also among the cheapest to buy in the fall. Fermentation might not be the most appetizing-sounding word, but this chemical process is to thank for everything from alcohol to yogurt. You may have seen or heard somewhat recent studies regarding the importance of the microorganisms in your gut. Even though the science behind fermentation is only recently informing our diets, humans have been fermenting food for centuries. Other animals take part in letting food rot, also, since it often makes certain compounds found in our foodstuffs easier to digest. Lactic acid bacteria, a result of fermentation, stimulate and aid our immune system. They also fight off pathogenic bacteria and can suppress tumors and cancer cells. Fermented foods have complex tastes that can easily boost the flavor profiles of your everyday meal. Want to know the best part? Making fermented food is super cheap. For many fermentation recipes, all you need is a vegetable (like cucumbers, cabbage, or radishes) and some salt. Besides, fermenting your own food is a project you can brag about the next time one of your friends complains about the sniffles. If you are reading a post on how to save money and be healthy by augmenting your diet, chances are you know your way around a farmer’s market or health-centric grocery store. 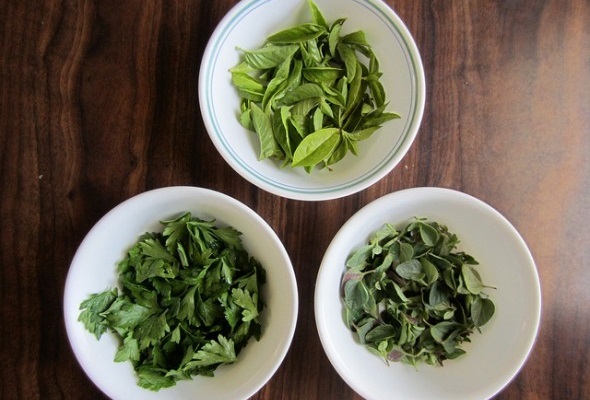 This means that you know where to find fresh cut herbs. If you don’t, find out quickly, because they may just save your life. Or at least, they will keep you healthy. Be careful with information on the health benefits of herbs, as there is a plethora of unsanctioned info to be found. If you have any serious medical conditions, make sure you check with a doctor or registered dietitian before incorporating herbal remedies into your diet. Now that we have the safety concerns out of the way, here are a few herbs that can easily boost your body’s systems. • Ginger- popular to liven up meals, as a condiment in Japanese cuisine, and as a tea, ginger is a serious digestive aid. It also has antimicrobial and pain-relieving properties, making it usable externally and internally. • Turmeric- if you are looking for one herb to improve your health, this is it. I even know someone who puts turmeric into capsules for herself as a regular part of her health regimen. Turmeric has been used for centuries for diseases from A-Z, and also as a substance for products like tooth-whitener and dye for clothes. It aids in liver function, digestion, heart health, and has anti-cancer properties. It is also an ingredient in curry, in case you needed any further reason to order Indian take-out. • Dandelion- there are several TV-related jokes I could make here (Orange is the New Black, anyone? ), but I’ll spare you. You will be spared bad health too, if you are up for trying the bitter plant. Dandelion is a great detox herb, aids digestion, and supports liver function. My roommates and I used to drink dandelion tea after a particularly noxious weekend of drinking. Kirsten Jadoo Kirsten Jadoo is a writer and voracious reader. She is an expert in home buying, credit and budgeting. Kristin's passions for food and travel leave her in constant search of creative ways to make and save more money.